What If The PlayStation Vita is Just Another PSP? I worry about Sony's new PSP. After the shock of the impressive visuals of Sony's next-generation portable, the PlayStation Vita, had become familiar, after the pleasant surprise of the new handheld's price settled in ($249 USD, the launch price of a PSPgo), I started thinking about the harsher realities of the Vita. Is it just another PSP? I was an early adopter of the PSP. I enjoyed it for Lumines, Mega Man Powered Up and Wipeout Pure, later for Jeanne d'Arc, and most recently for Tactics Ogre: Let Us Cling Together. I wound up enjoying my Nintendo DS more, mostly for game experiences that I believed I couldn't get anywhere else. My PSP rarely gets attention anymore, largely because its experiences felt lesser than similar experiences on consoles. 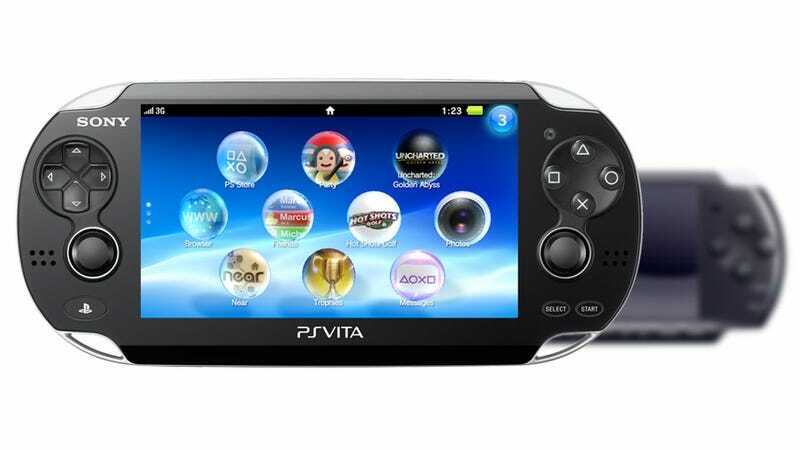 So I fretted a bit: What if the Vita is another PSP? What if there just wasn't enough to differentiate Sony's next, glossy, graphically rich portable game machine? That was a question I posed to PlayStation's Shuhei Yoshida, president of Sony Computer Entertainment's worldwide studios. "That's a question we asked ourselves when we started working on Vita," Yoshida said in a recent interview with Kotaku. "We looked back on PSP, what we did right and what we didn't do right with the platform. We were too happy with ourselves, having a PS2-like experience on a portable at that time. We didn't go too much further from there. "The initial couple years were great," he continues. "People were excited to be able to play 3D graphics on the go, but after a couple years, people get used to looking at pretty pictures." Yoshida's story of the PSP, its initial appeal as a portable version of the Sony's best-selling PlayStation 2 and the dulling of its shine, feels familiar to me. "When you compare the gaming experience on PSP to what you get on PlayStation 2 and later on PS3, because of the bigger screen on the TV and the dual analog sticks, [players] feel compromised playing on PSP," he explains, quite frankly. "You're not getting much unique on the PSP." That had to change. In designing the PlayStation Vita's interface, its dual touch panels, its dual analog sticks, gyroscopic control, Yoshida says it was game developers who pushed Sony's engineering team to offer something more unique and compelling in the long term for the platform. "That was the thing at the very beginning of designing the hardware that we wanted to overcome," he says. "Of course, we wanted to offer better visuals. That's the 'gene' of PlayStation." Yoshida and his teams sounded concerned about Vita games being indistinguishable in their appeal from their PlayStation 3 siblings too. He says his studios "spent a lot of time looking at it, evaluating devices and creating prototypes of games," short demos that focused on making Vita games special. We've seen some of the more interesting uses of the Vita in games like Sound Shapes, LittleBigPlanet, Gravity and Little Deviants. We've seen very handsome games that showcase Vita's power, like Uncharted: Golden Abyss. Perhaps its most intriguing function is cloud save sharing between the Vita and PlayStation 3, a better leap forward for PlayStation connectivity. "Hopefully, as people try more of our titles, people will see this is what makes the Vita unique from consoles," he says. Sony's PlayStation Vita also has another concern: development support, which has slowed dramatically in the West. I asked Yoshida if Japan really needs the Vita right now, as the original PSP is still going strong, still well supported. Surely North America and Europe should get it first, I proposed, hoping that he might offer hints about the Vita's release date. "It's very interesting issue that we have faced in the different regions," Yoshida said, dodging slightly. "Some of the people in Japan insisted that Japan can wait longer for the Vita. The PSP is still so popular. Some of them fear that once we announced Vita, like we did in January, that we might lose momentum, but it didn't." "Each region has its own situations, but we are trying to take the best of those situations," he added. "Development support from Japanese companies has been incredibly strong; they have some of their best teams working on portable systems. And that's one of the biggest reasons why the PSP is so popular." I like the Vita's chances. I've liked many of its early games. I want to continue liking its later games for their own unique capabilities. I hope that it's not another PSP.